Includes one 14" synthetic mohair beard and moustache set. The beard and moustache are one piece and are worn using the attached elastic strap for comfortable one size fits most sizing. The beard is available in black, brown, gray, or white. 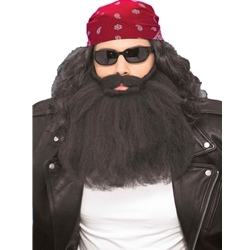 This beard can be used for a number of different characters including pirates, hillbillies, biblical men, cavemen, and more. This beard and mustache set is great for directors who are on a budget and is also available in 18" and 25" versions.